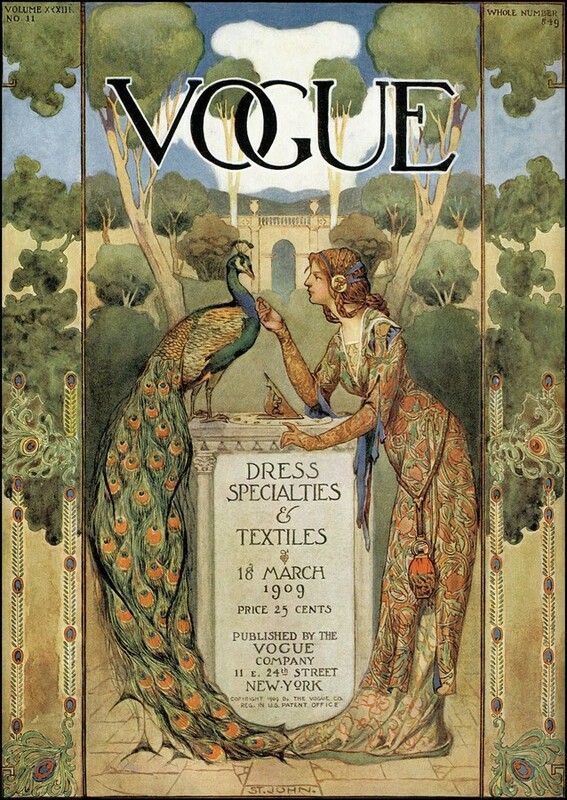 Welcome to part two of a three part series by The Art of Dress in which we explore the influence of one of the world’s most beautiful birds, the peacock, and one of its “Golden” ages of influence on fashion from 1894-1920. 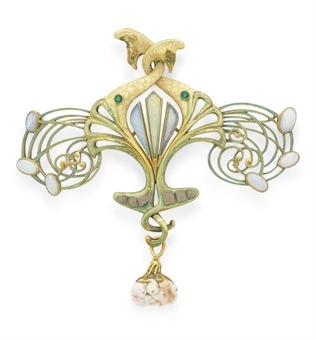 At the turn of the century, the peacock’s curvilinear form, proud stature, and expansive tail appealed to jewelry and accessory designers of the Art Nouveau and Arts and Crafts Movements. 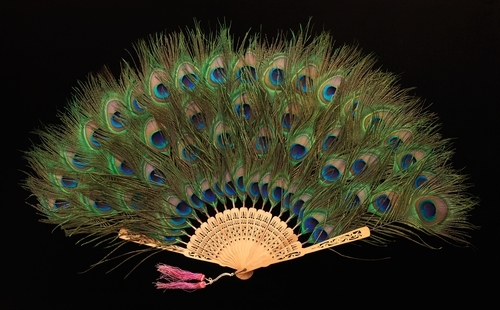 The fan was an indispensable part of the fashionable woman’s ensemble and the craftsmen who made the exquisite examples featured here employed the peacock in two markedly different ways. Artist Adolphe Thomasse opted for a more literal depiction of the peacock, using the natural fanning of the bird’s tail to define the sweeping arch of his artfully crafted fan, while an anonymous artisan incorporated actual peacock feathers into wooden leaves of a fan, a more typical, but none-the-less-beautiful, approach. 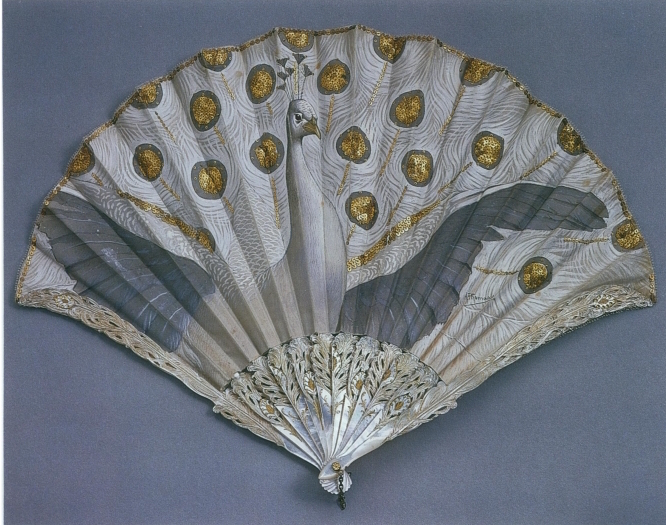 Folding fan by Adolphe Thomasse for Duvelleroy, Circa 1905-1910. In the collection of the Philadelphia Museum of Art. 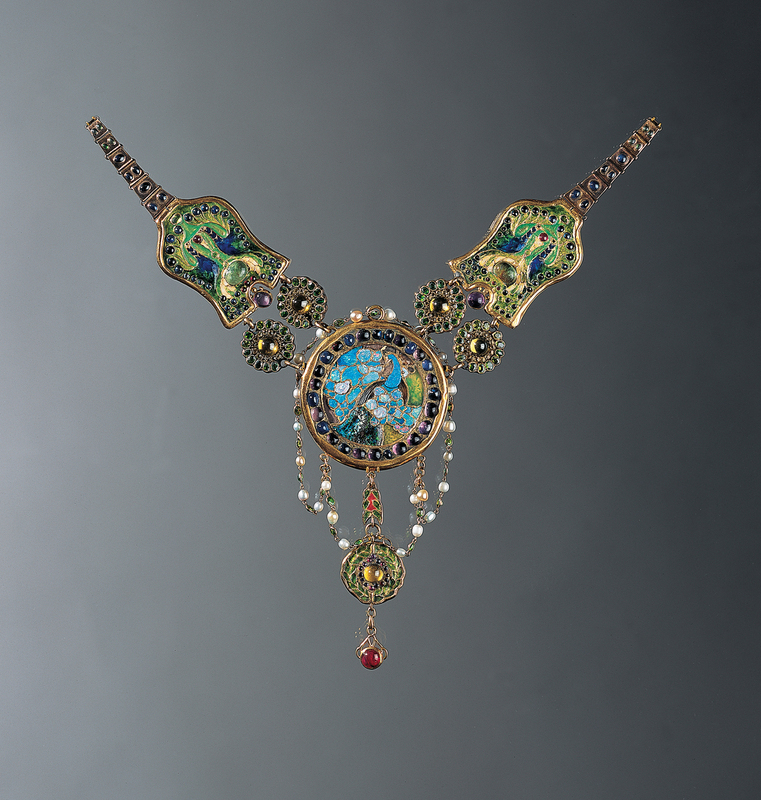 Similarly, jewelry designers of the era depicted the peacock in a variety of stylized and realistic form, using a menagerie of metals, precious, and semi-precious stones. 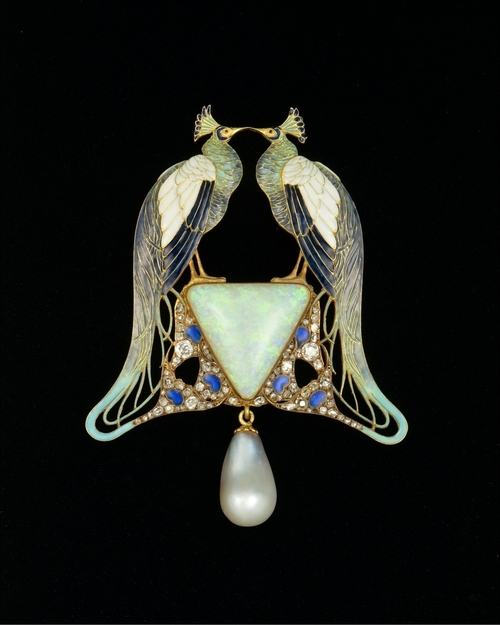 Louis Comfort Tiffany—a name synonymous with opulent and luxurious jewelry even today—presents the peacock in a miniature mosaic of sapphires, rubies, and emeralds, while René Lalique and Georges Fouquet arrange dual peacocks in mirror images, all in the curvilinear style embraced by artists of the Art Nouveau style. 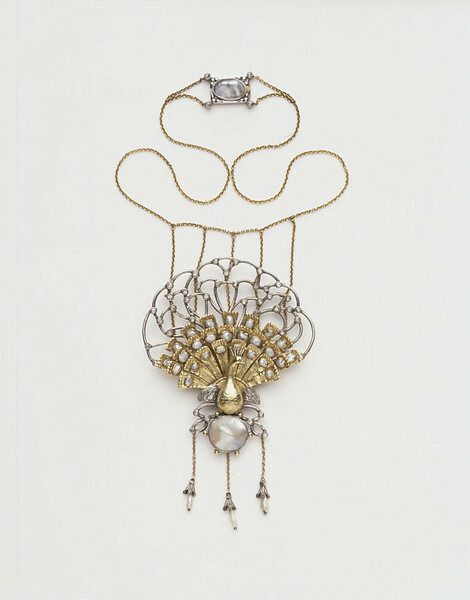 Charles Robert Ashbee utilizes the bird’s body to full effect in this silver and gold displaying peacock—a tribute to the beautiful hand-craftsmanship championed by artists of the Arts and Crafts Movement.